To sign up for more information on Pulaski Players, please enter info into the form to the right. We are so excited to announce the rebirth of the Pulaski Players and our first 2016 performance, The (Almost) Totally True Story of Hansel and Gretel, written by Steph DeFerie. May 13th at 7pm and 14th at 2pm. THE PULASKI PLAYERS NEED YOUR HELP! “(Almost) Totally True Story of Hansel and Gretel, The” is presented by special arrangement with SAMUEL FRENCH, INC.
Just driving by the Hawkinsville Opera House hits me hard with sweet nostalgia. Whether attending events or participating in them, The Opera House provided me with something I will always cherish: a genuine love for the arts. Backstage or stage center, putting on a show was one of the most fulfilling activities of my entire life. Hearing the audience laugh during a funny part of The Music Man or give a standing ovation after a great show gave me (the girl with one line in the entire show) a sincere feeling of accomplishment. Even a small part was important because a town scene could only be perceived as so with multiple bodies. Each one doing its own job. You wipe windows. You hold a basket. You talk to your friend like you’re gossiping. All the pieces came together. The curtains went up and down when they should. The lighting crew knew exactly when Ms. Marion would be walking out. Beautiful sets were built and positioned appropriately. It was a well-oiled machine. Not one person wasn’t important for its success. Read More on www.themunchkinnugget.com. 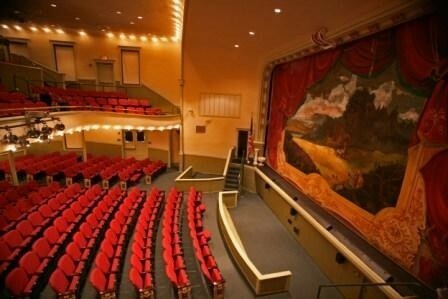 The Opera House is owned by the citizens of Hawkinsville and is maintained and operated by the Hawkinsville-Pulaski Co. Arts Council.